Intricate carvings and metal hardware set the mood for stunning European-influenced old-world design. Product Description European Influence. 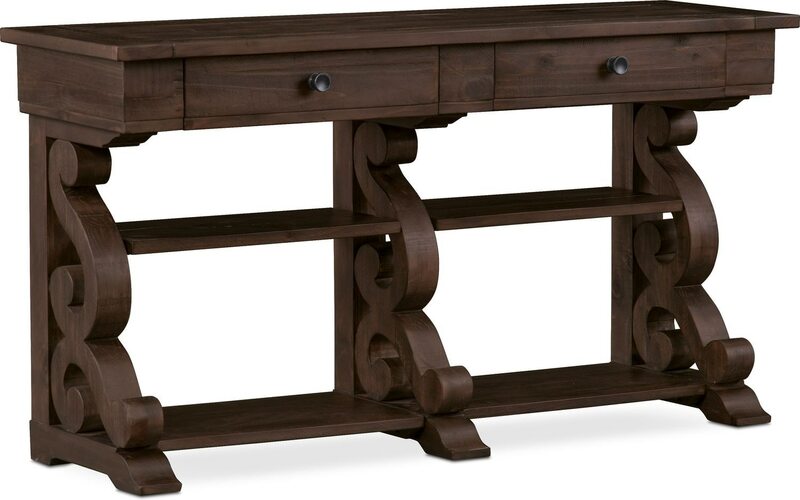 Rustic and grand, the Charthouse sofa table abounds charm. Build your décor around this farmhouse-inspired accent piece, which features a pine support and gracious S-carved detailing. Pine wood and veneer construction with a rich charcoal finish evokes the romance of reclaimed wood, further highlighted by knotty features and rich grains. Pair with the Charthouse dining room collection for an effortless flow of style from room to room. Customer assembly required. Unique Features: Pine solids and veneers feature a deep brown finish with charcoal undertones. Pine support bar completes the modern farmhouse look. Two drawers offer plentiful space for storing entertaining essentials or electronic accessories. Antique brass hardware features a pewter overlay for a rustic aesthetic. Gracious S-carved details exhibit the high level of craftsmanship. Constructed of pine solids and veneers for resilient strength and longevity.